The Armenian victory in Sartarabad, from May 22-28, 1918, became the cornerstone of the foundation of the first Republic of Armenia. However, the victories of May 1918 and the first republic remained taboo issues in Soviet Armenia until the national awakening of the 1960s that led to the commemoration of the fiftieth anniversary of the genocide in 1965. Afterwards, there would be a historical reassessment, although within the ideological constraints imposed by the regime. The entrance of the impressive complex, which extends over some 50 acres, is guarded by gigantic winged bulls, which symbolize the victory obtained by the people. The steps take the visitor to a wide square, dominated by the 115-foot high bell tower. The nine-bell structure, built from red-orange tufa stone, is the focus of the monumental complex. It reflects the critical moment that the entire country lived and that called the people to the fight. As it is well known, Catholicos Kevork V ordered all church bells in Armenia to sound day and night in the days of the three battles of Sartarabad, Gharakilise, and Pash Abaran. The bells sound every year on the day of the victory. 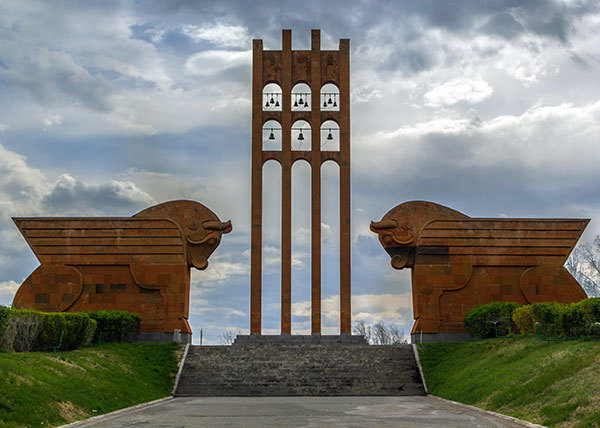 As the refrain of the famous song written by poet Baruyr Sevag exhorts, “Generations, know yourself in Sartarabad.” The monument to the battle is one of those mirrors that have helped know history for almost half a century.